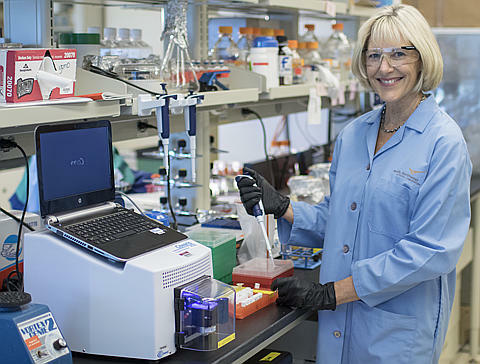 On May 13 Janet K. Jansson, Chief Scientist for biological sciences at Pacific Northwest National Laboratory, was among federal, academic, business, and citizen-science experts who took part in a three-hour White House webcast that launched the new multi-player, multi-layer National Microbiome Initiative. It is the work of the White House Office of Science and Technology Policy (OSTP), which organized the webcast; 12 federal agencies involved in energy, health, and agriculture; and the private sector, including universities and foundations. The initiative started with a bang: $400 million in new commitments from non-government entities and $121 million in pledged federal investments starting in Fiscal Year 2016. That includes $10 million in Fiscal Year 2017 for multidisciplinary research at the Department of Energy. "We think," said event moderator Jo Handelsman of OSTP, "it's a microbial future." "Microbiome" describes the teeming, tiny, collaborative communities of microorganisms that so momentously live in and on all forms of life and in the atmosphere and oceans. The microbiome represents an immensely complex, little-known "dark matter" issue in biology that has widespread implications for human health, the environment, agriculture, and an energy future tied to biofuels. The initiative will push boundaries and change our understanding of the world and will open new avenues for scientific advances, said Rep. Louise Slaughter D-NY, the only microbiologist in Congress. "It's going to be like splitting the atom when we get all this done." Jansson, a 25-year microbiome researcher, was part of the event's innovation panel, where experts were asked to take a speculative "blue sky" look at imagining how microbiome research could be improved. "I had been working in microbiomes before it was cool," she said, beginning with her 1988 Ph.D. dissertation on ways to extract DNA from the soil. In her brief statement, Jansson mentioned PNNL research investigating how microbiomes can affect climate change and on how microbial communities interact. She acknowledged the technological challenges of going beyond DNA sequencing in order to address how microbiomes function, including an understanding of their metabolic pathways. Multi-omics approaches and improved mass spectrometry (a strength at PNNL) are part of the answer, said Jansson. She also acknowledged the challenge of the complex microbiome itself, whose habitats range from a two-pound microbial collective in the human gut to the sediments and surfaces of the world's oceans. (In all, microbes make up about a third of the biomass on Earth.) How complex in the microbiome? A single gram of soil alone can contain a million microbial species, said Jansson. "If you can tackle soil, you can tackle anything." That lined earned the webcast's first applause line. Jansson is a frequent commentator and contributor on the microbiome issue, and a key national player in drawing attention to its importance. Last year she co-authored a paper in Science that called for "a unified initiative to harness Earth's microbes" by widening international collaboration and multidisciplinary research. (DNA sequencing alone, though useful, the paper said, "has mainly yielded snapshots.") Last December Jansson was part of a White House roundtable on the microbiome initiative now in place. In March, she was corresponding author on a letter in Nature on how thawing in arctic permafrost awakens microbes to produce climate-affecting methane. And in late April Jansson co-authored a Nature Microbiology commentary with Erin S. Baker, an Integrative Omics scientist at PNNL, on the need for multiple omics technologies to supplement metagenomic sequencing in the study of microbiomes. Jansson also directs PNNL's Microbiomes in Transition (MinT) Initiative, an interdisciplinary investigation of how microbiomes function and how they respond to perturbations, including climate change. She is president of the International Society for Microbial Ecology, a fellow of the American Academy of Microbiology, and a member of the steering committee for the Earth Biome Project, a new collaboration of international scientists collecting data on the microbiomes of soils around the world. PNNL's Janet K. Jansson was among experts who took part in a three-hour White House webcast that launched the new National Microbiome Initiative. Jansson, a 25-year microbiome researcher, was part of the event's innovation panel, where experts were asked to take a speculative "blue sky" look at imagining how microbiome research could be improved.